I wasn’t expecting one of my highlights of New York to be Time Square, i had thought of it as touristy and cheesy which i guess in many ways it is. But when i first lay eyes on it I felt like a little kid again, my head span with color, height and sheer amount of fluorescent lights. I’m sure it helped that we where on our way back from a night out at the Public Assembly in search of late night pizza but a more sober return trip resulted in the same feeling of excitement and awe. 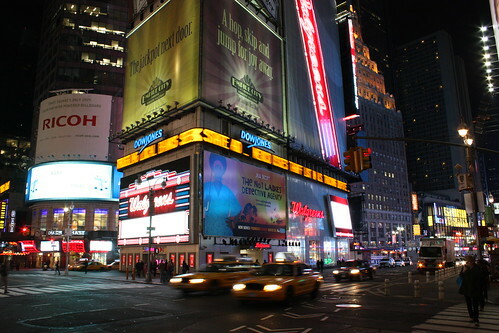 I was a little disappointed by the size of Times Sq, much like the Satue of Liberty, it was smaller than I expected. That said there is a certain electrifying feeling from just standing there and I think this is in no small part due to the amount of times we’ve seen it in movies.